I found this recipe I wanted to try, and it was a Saturday when I had nothing to do. I never cleaned my house or anything constructive like that, so my schedule was completely open. I made a double recipe -- there were probably about 50 of them in total (they were really big cookies). They turned out really well...a little soft and chewy, but enough structure that they didn't fall apart. I felt great about them because most of the ingredients were organic and it was one of the first baked goods I made totally from scratch. I had a couple of them while they were still warm, and really enjoyed them. Then I sat down and started watching TV. I felt a little guilty about eating cookies for breakfast. I got hungry, so I went to the kitchen and ate a few more cookies. More TV watching. More cookies. The guilt started to get overwhelming. And the anxiety kicked in. I ate some more cookies to help myself feel better. Then I started to really panic. What was wrong with me? Why was I eating so many cookies? How many had it been now...like 15? 30? And I hadn't eaten anything else. Overwhelming anxiety. More cookies. More anxiety. More cookies. My whole day was a whirlwind of guilt and stress and cookie eating and self-loathing. It didn't stop until bedtime. I had eaten almost all the cookies. And I felt really, really sick. And I felt really, really out of control and unhappy. At the time, my explanation for this event was pretty straightforward (and familiar): I was out of control, and I was disgusting, and I had no will power, and I needed to learn how to control myself. Cue diet, cue bingeing, cue exact same response as last time. Repeat a million times. This was my life for about 15 years. How could I have prevented it? And, more importantly...what can you do to fix this pattern in your own life? The downward spiral of guilt and anxiety and self-hatred was inevitable with all my beliefs about myself and about what that particular food meant to me and what I thought I "should" be doing to be a good person and how I was using this crisis to distract from the actual problems of my life. What if cookies were just some other kind of food that I eat sometimes, and they weren't forbidden or guilt-inducing? What if I felt fine about myself and didn't have any kind of judgment about the kind of person who eats cookies for breakfast? What if I could identify why I was unhappy in my life and directly address those issues? Maybe I would have just had a couple cookies and been done with it. You won't undo years of programming right away, but you CAN do it. I did it. Lots of people have done it. You just need to know what to do, and get the right support. 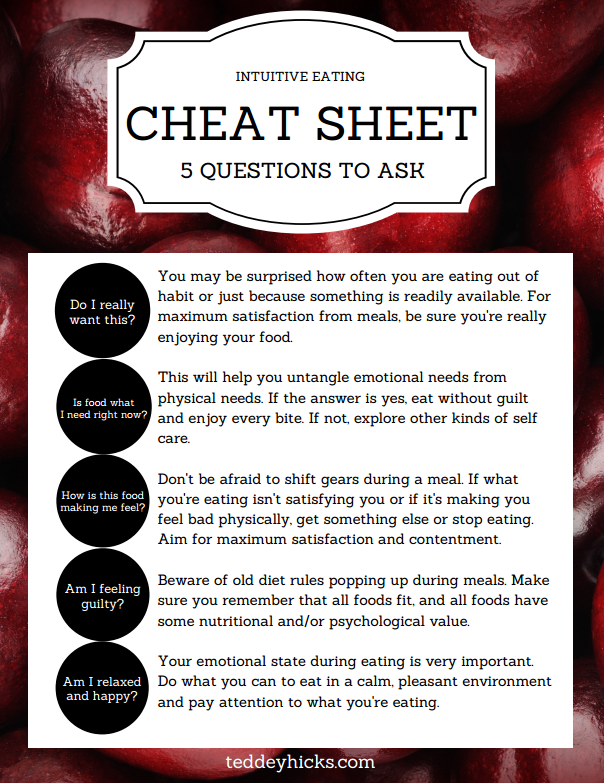 The keys to fixing your relationship with food are many and varied. In my coaching practice, I focus on permission to eat without guilt, challenging your beliefs about health and weight, feeding yourself sufficiently and thoughtfully, trusting your intuition, and figuring out what you really want out of life (I bet you didn't dream of being a dieter when you were a kid!). The first step to turning things around is wanting to make a change. If you really feel that the way you are living right now isn't working for you, and you want more out of life than obsessing about food and your body, you're ready to go. Nothing can stop you once you've made the decision to be better. Nothing.